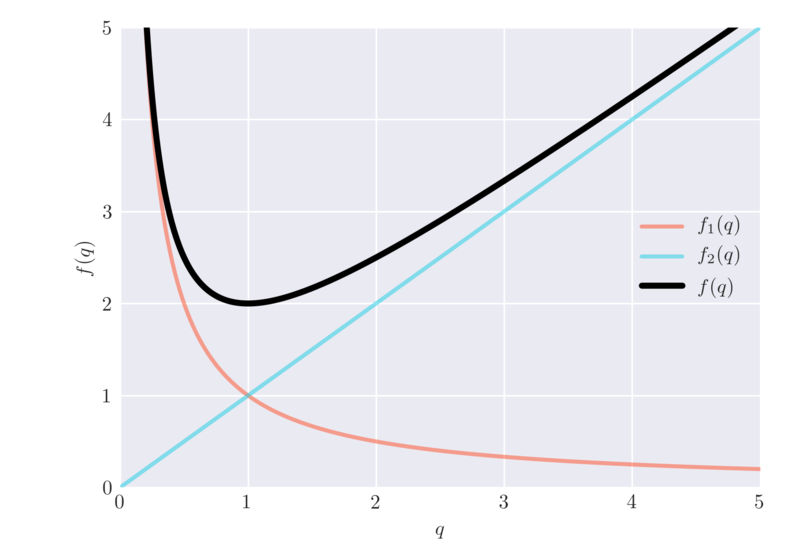 I've learnt to roughly draw graphs of various functions like isoquants of Cobb Douglas function, i.e., $k=√q/L$. Here first derivative is negative so it's downward sloping and second derivative is positive so convex to origin. Now if Short-Run cost function is $C = (w/k)q^2 + (rk)$ then average cost is $AVC= (w/k)q +(rk)/q$. First derivative is $(w/k)-(rk)/q^2$ but how do I know if it's positive or negative? This term is drops as $q$ increases, and diverges when $q$ is small. This is a linear term with slope $\alpha$: it is small for small $q$ and large for large $q$. In this particular case the function one of the terms grows while the other shrinks. So in extreme cases only one matter. The question is where is the point in which one becomes more relevant than the other. If you notice above I always use the expressions small and large, but these are relative words. You can actually find a value $q^*$ at which these two terms are equal, and this defines in which each term dominates. Not the answer you're looking for? Browse other questions tagged microeconomics production-function cost or ask your own question.